It seems there are a lot of issues raised with the film “Exit Through the Gift Shop”: Was it a mockumentary? Is this Mr. Brainwash a “real” artist, or is he just conning the audience with a fake French accent and those dumb lamb chop sideburns? Is this art a joke on the art world? Is the art world a joke? Etc. etc. Humble opinion: “Exit Through the Gift Shop” is wonderful and I think it proves, once and for all, there is no longer any difference between “applied” art and “real” art…except of course the attitude of the “artist” and how well he or she is able to convince someone else that this attitude is somehow special or original or important. 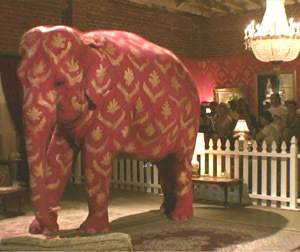 And in the spirit of the film, this attitude is the elephant in the room, not the art. Once in a class taught by the venerable Milton Glaser at SVA, someone asked what the difference was between art and graphic design. Milton replied “art inspires awe” and in the case of Mr. Brainwash, he may be right. Only not the kind of awe you might think of when looking at the Sistine Chapel. (Questions like “Wow, how’d he get up there and not break his neck?” are not what Glaser meant). In this case, I am awed by what attitude can create and provoke. In the film, we see Thierry Guetta, after what seems like years of following other artists around, filming them and helping them in the clandestine process of making street art, decide that he too is an artist and will make his own work. According to the film, this decision was “encouraged” by Banksy himself, but when it happened and Guetta became Mr. Brainwash, he was so convinced he could become an overnight sensation, he put everything on the line, as in every penny he had or could leverage into making his first show. And with a little help from friends like Banksy and Shepard Fairey, he does become an overnight sensation, possibly overshadowing both of these guys, the ultimate joke of the film. Is nothing sacred? When nothing is sacred, make everything sacred. What if “modern artists”, especially the visual ones, were actually Art Directors with attitude? I don’t think this takes anything away from them, but it sure makes me look twice at what we used to think about Art Directors. I’m not talking about the shrill guy (or gal) that carries on all morning about the fact that the client insisted on another font and ruined the ad. It’s the 21st Century artistic paradigm shift – Either “real” artists today are much lower on the food chain than we thought, or Art Directors are actually much higher. Either way, things just aren’t what we thought they were. I like that a lot. The honesty of Mr. Brainwash! In the film, we get to see an army of creative worker bees preparing for the “Life is Beautiful” show in LA. They execute the idea: he approves or not. Sounds a lot like an art department, huh? We were told that artists have “vision”, and maybe, in the end, that’s all they are supposed to have. Mr. Brainwash claims to have it, except that his vision is dependent on the vision of someone else; well, Andy Warhol for one. But this doesn’t matter. The collectors who bought the Warholesque stuff by the dozens didn’t care one bit. In fact, I think it helped them feel more comfortable about writing that big check. Are you the next Mr. Brainwash? L­_Switch2020 (aka Clare Ultimo). Keep your eyes on the tops of buildings at night.